Back cover blurb: Would you risk everything for a second chance at first love? At forty-nine-going-on-fifty, Adam Sharp likes his life. He works part-time in IT consulting, is a leading member of his local pub-quiz and has a stable relationship with his partner, Claire. But there's something he can't shake: a longing for the life he might have had with smart, strong-willed actress Angelina Brown. Then, out of nowhere, Angelina walks back into his life. All the intensity of their affair twenty years ago resurfaces and Adam must make a decision. Should he let her go again? Or does he dare to live dangerously? The heart warming new novel from Graeme Simsion, the international bestselling author of The Rosie Project and The Rosie Effect. 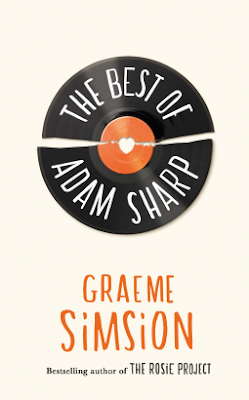 The Best of Adam Sharp is a perfect novel for a music lover like me. A breath of fresh air in between a couple of heavy crime novels. A really lovely story of how music can bring people together, and how a single song or lyric can stir up memories long forgotten. Adam Sharp is an IT Consultant, forty nine going on fifty, a regular pub quiz goer with a stable long term relationship. He is happy, content, so he is shocked when he receives a message from an ex-girlfriend, Angelina out of the blue. Adam met Angelina Brown, actually the love of his life, at the age of Twenty Six. He was playing the piano and singing in a bar in Australia whilst travelling and it was love at first sight. She was a goddess. Sadly their relationship was doomed from the start, she was a famous Australian soap star, and his time in Oz was limited. But that didn't stop them falling head over heels for each other. When Angelina asks him if he dares to live dangerously, Adam sees it a challenge. But can two people who loved each other more than Twenty Years ago really still have feelings for each other. And if they do, what should they do about it? The Best of Adam Sharp is available now via Amazon online and all good book shops. Thank You to the publishers who invited me to view this novel via netgalley in exchange for an honest review.